On a cool, overcast day in late-August, we found ourselves at Steady Hand Farm: the small-scale vegetable farm of Jason and Juli Montgomery-Riess. 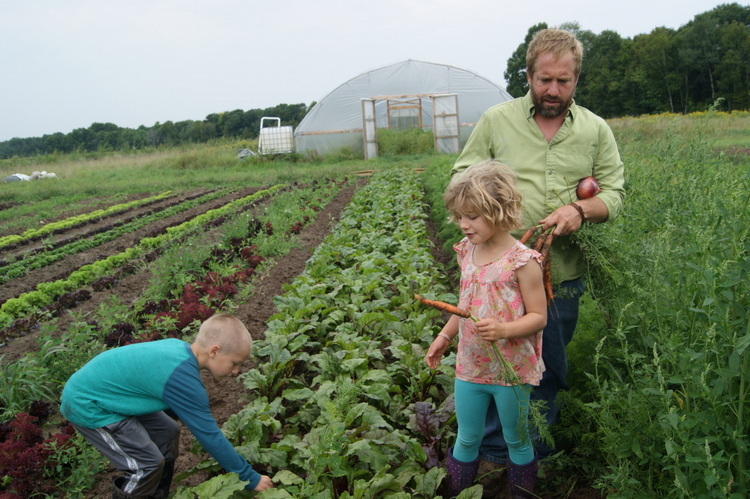 In the gentle stretches of prairies and woodlands in Amery, WI, Jason and Juli raise organically-grown produce and three sprightly children – Walter, Alma, and Ida. 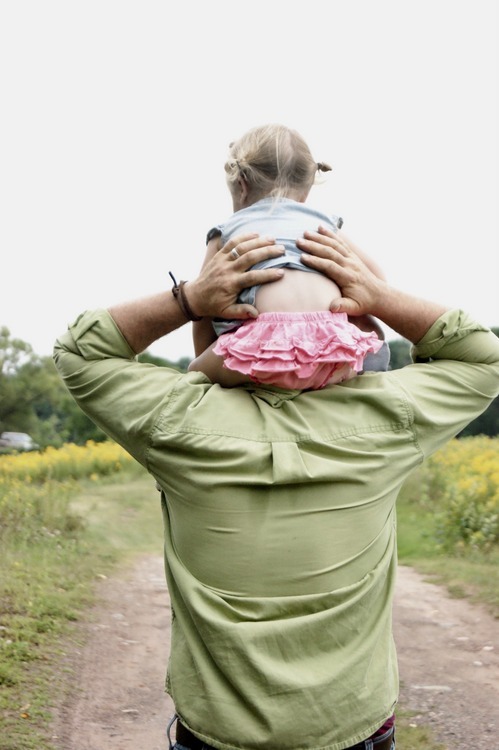 At Steady Hand Farm, the land and the family are symbiotic. In their farm practices, Juli and Jason “consider and promote biological diversity…” as they state on their website. “We want food that is safe for our family, friends and neighbors. And just as we want to keep our human community vibrant, healthy, we want to preserve the good life of our companions in this work: the soil, plants, insects, and animals with which we share the land,” (steadyhandfarm.com). 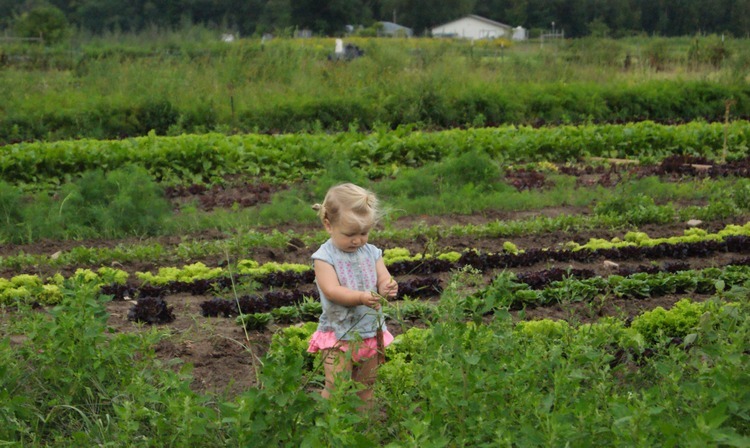 These sustainable values were abundant in the family activity as we toured Steady Hand Farm. 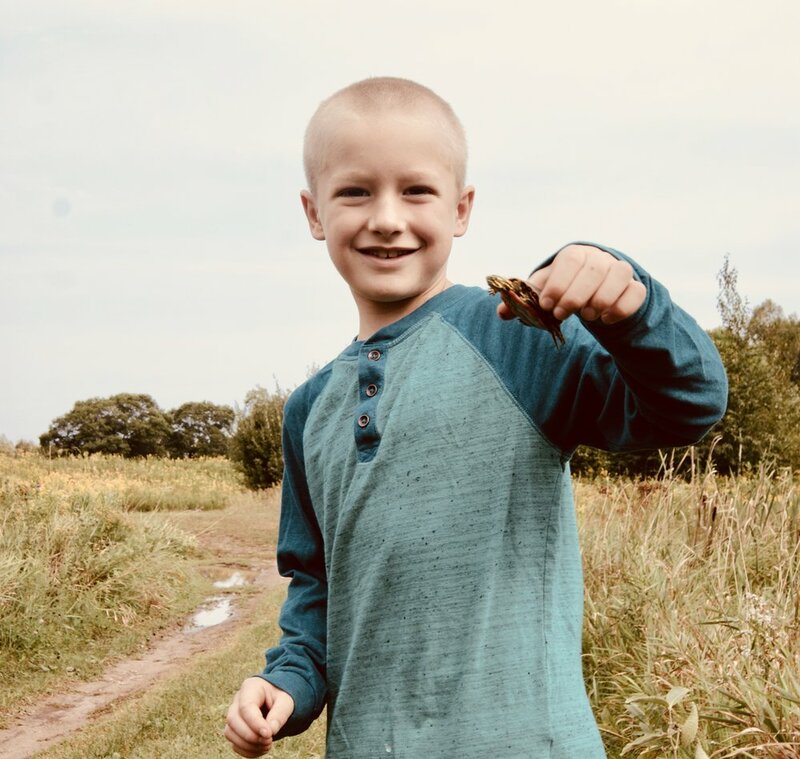 While Jason and Juli patiently described the ins and outs of growing vegetables, the kids romped and played around us, alive with curiosity as they splashed through puddles in their galoshes, discovering frogs and turtles and hidden treasures. With a child’s doll tucked under his elbow and a giant onion in his hand, Jason good-naturedly explained their salad planting methods in the greenhouse. “We call it succession of salad,” Jason laughed. “Every planting, we do a little more than 1,000 plants, which ends up being about two weeks of salad. 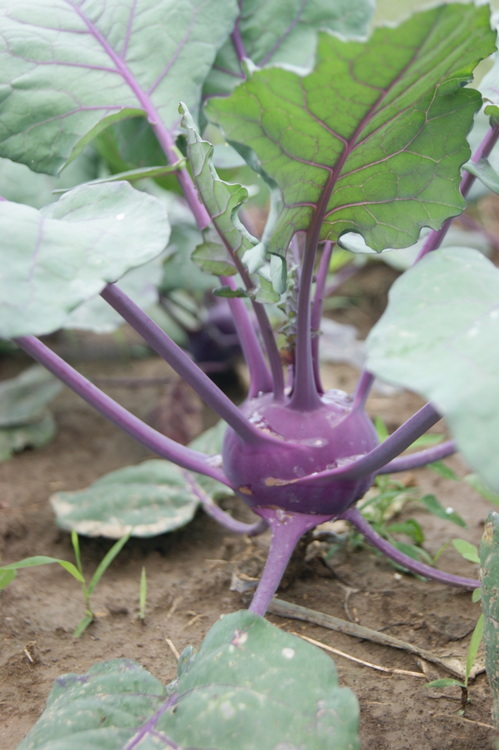 We’re harvesting about 80lbs of salad a week,” Jason shared. 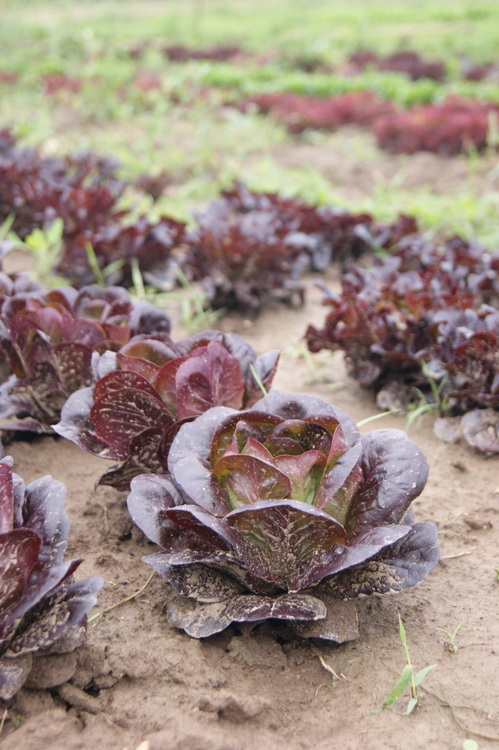 In addition, growing lettuce is a constant, season-long process. “We seed almost weekly. We start at the end of February or the beginning of March and seed weekly until the middle of August,” Jason said. Standing in the greenhouse full of vibrant greens at various stages of growth, it was easy to see the extensive amount of work required to consistently produce this quantity of lettuce. We moved on from the greenhouse and walked along a path that cut through the field, meandered through the woods, and ended in an expanse of prairie. Swatches of colorful produce spread over the rolling hills like a patchwork quilt. “We work about 4 acres of land, grow about 40 different types of vegetables, and have a couple of fields of cover crops” Jason said, as we stood in the rows of cabbage and carrots. 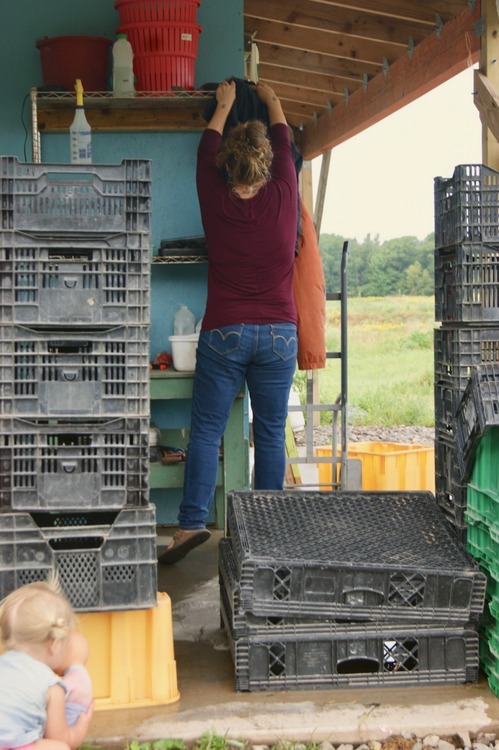 Using organic practices and responsible use of the land, Steady Hand Farm produces vegetables from Spring until Fall for its CSA members, the St. Croix Falls Farmer’s Market, and its restaurant clients including The Watershed Café. Growing sustainable, quality food on a larger scale demands an intentional approach and a balanced use of natural resources. “It’s a long-term process,” explained Jason. “Every time we grow vegetables, we are taking nutrients from the land, and it requires that we condition the soil. We replenish in the form of compost, manure, micronutrients, cover crops, and the way we prepare the beds for production.” This give-and-take relationship with the land is the heart of Steady Hand Farm. Tending the land by hand, without the use of pesticides or herbicides, is a rigorous way to farm. It requires long hours of hard physical labor and constant work. 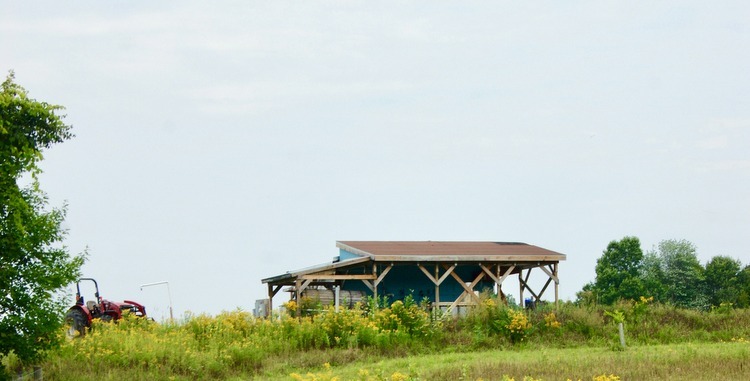 Other issues, such as access to land, an unbalanced economy, and cultural perceptions of quality food pose additional challenges for Steady Hand Farm. “For a small-scale vegetable farm, better pricing would make it more possible to earn an income on farming,” Jason expressed. “Also, the prices in the market are suppressed, and the prices of produce are shifted onto the people and land in the form of harmful pesticides and chemicals,” Jason explained. For Steady Hand Farm, education is key to overcoming these obstacles. “Local, naturally grown food is different than produce grown for travel and a long shelf-life,” said Juli. “We produce food for quality, flavor, nutrient value, and locality,” she shared. Communicating these differences in value, and teaching members how to use the produce they receive, personalizes the CSA experience. “It takes another skillset to cook food from scratch,” Juli said. “We like to share how we use the produce. We share how we use vegetables with eggs in the morning, in a breakfast sandwich, or in a salad. It’s about bringing more vegetables into your daily life,” she described. “With a CSA box, you’re committing to 3 to 5 nights of cooking at home and eating vegetables at every meal,” Jason added. “If you’re getting a large CSA share, you have to start eating vegetables for breakfast,” Jason laughed. Through community education programs, Jason and Juli are committed to spreading the value of natural, locally grown produce. “With funding from Wisconsin Farmer’s Union and support from Power Up, we gathered a group of local farmers together and presented at the local elementary school,” Jason said. “We helped the entire student body plant a seed – at least 400 seeds were planted, and the plants went into the school garden,” he explained. Engaging young people in the process of planting is an important mission for Steady Hand Farm. “We also do an event here at the farm called Kids at The Farm with 4th and 5th grade students from Lucy Craft Laney School - a school in an economically impoverished area,” Jason described. “We raise money to bring the entire grade here to learn how food grows. We have a vegetable session, a bee presentation, a cheese and bread-making demonstration. We’re very interested in these types of social engagement projects,” he said. The more time we spent with Jason and Juli, the more strength we gained from the experience. They share their land, their time, and the happiness of their family with natural sincerity. We found ourselves immersed in their farm. The connections and partnerships they share with those around them are genuine. “We’re in this together,” Juli said. “I love growing food. I love the relationships that come from that,” she expressed. It took only a second on Steady Hand Farm to see that is true. Jason and Juli provide The Watershed Café with fresh, locally grown produce on a weekly basis. We are proud to partner with Steady Hand Farm. 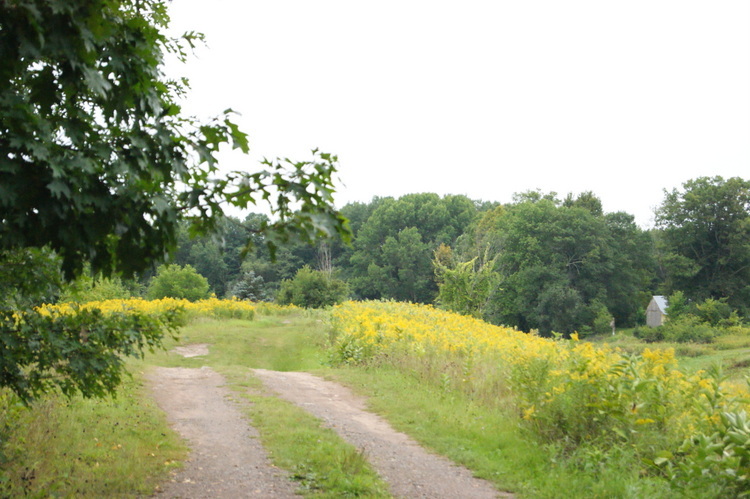 For more information about Steady Hand Farm, visit steadyhandfarm.com.